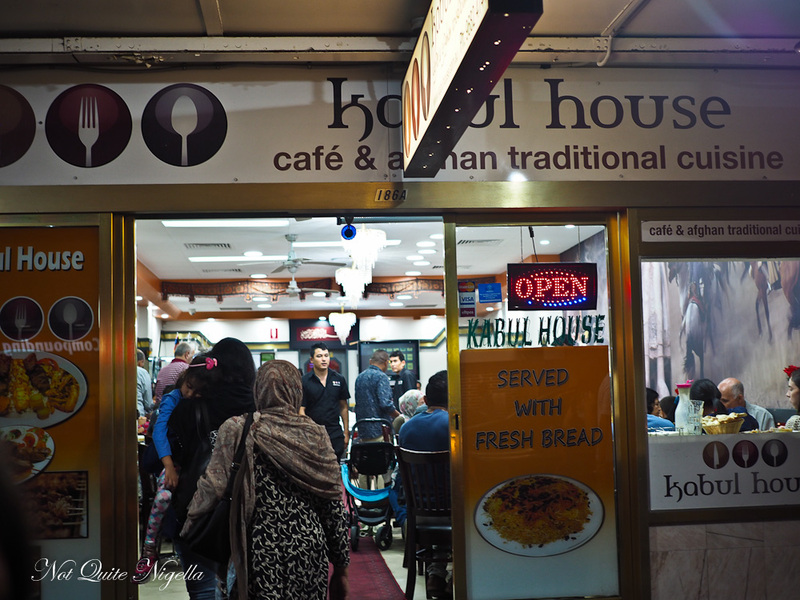 Kabul House was a Dear Reader recommendation from the lovely Mrs Flowerpot who has sent so many good eateries my way. We booked early at 6pm because she had warned that people spilled out the door. Louise and Viggo are already seated at the large tablecloth covered table. Nearby there is a raised stage where people can eat. 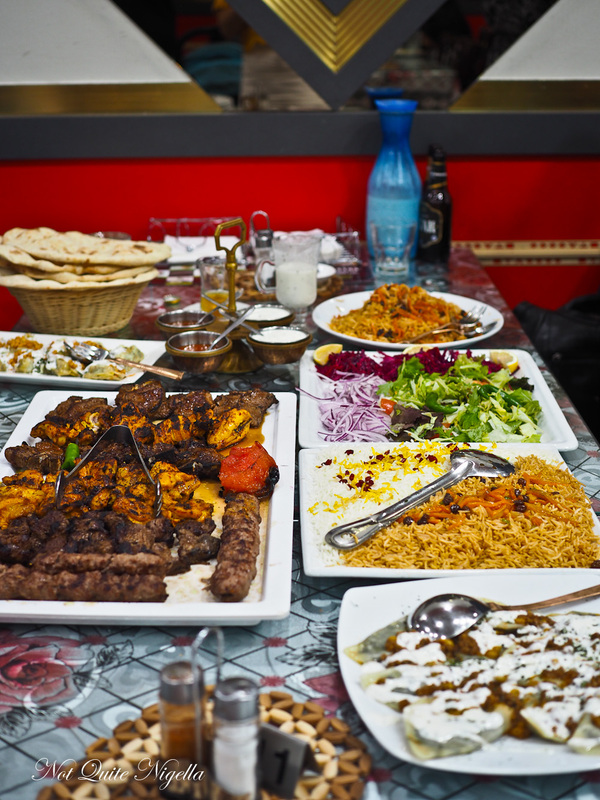 It reminds me of my time eating out in Oman and Jordan. We are handed fold-out laminated menus. On one side are pictures of dishes in case you want to pick by appearance. Our waitress is very friendly and take orders via a tablet and easily makes recommendations based on what is popular. I love yogurt drinks in every culture. 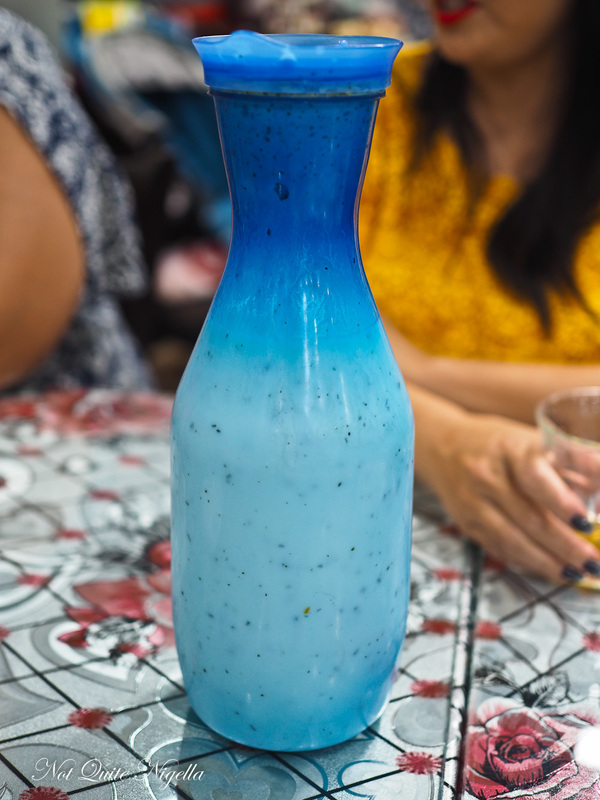 Some are thicker like lassi, some thinner like in Persian cuisine. 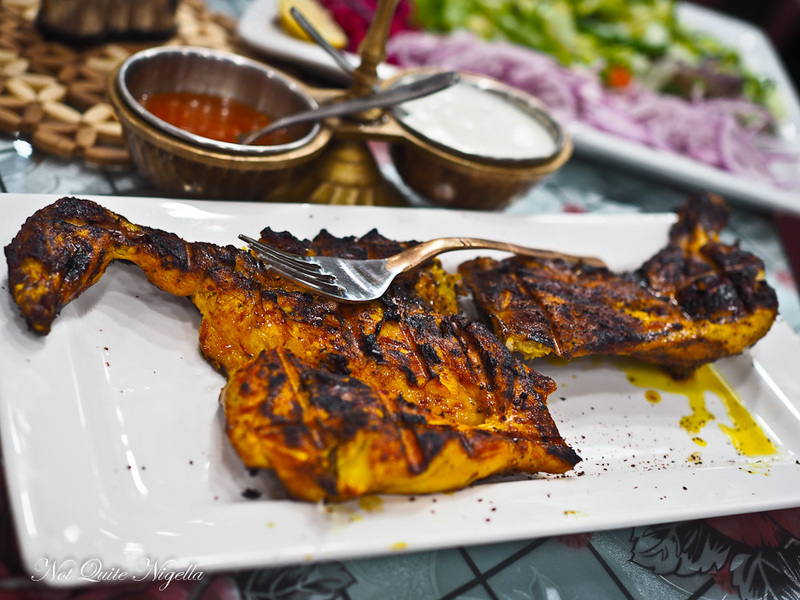 Here the texture is somewhere in between the two and it is served slightly salty with plenty of dried mint. It is pronounced dogue. 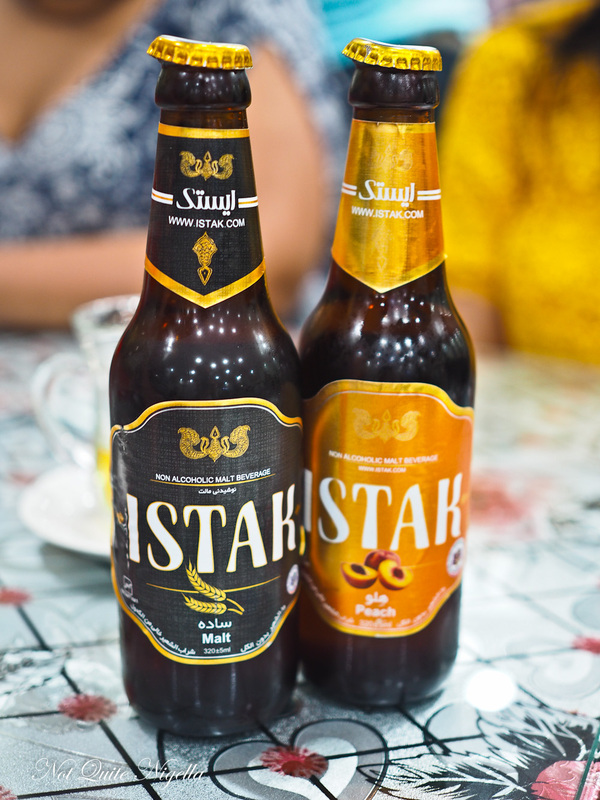 The soft drink fridge holds the usual suspects except for one brand called Istak. It comes in a variety of flavours and I choose a peach and a malt. The malt is like a non alcoholic beer while the peach is strongly flavoured of well, peach. We are at a table for eight really but it will prove fortuitous because we order so much that there's enough to take home for several dinners afterwards. 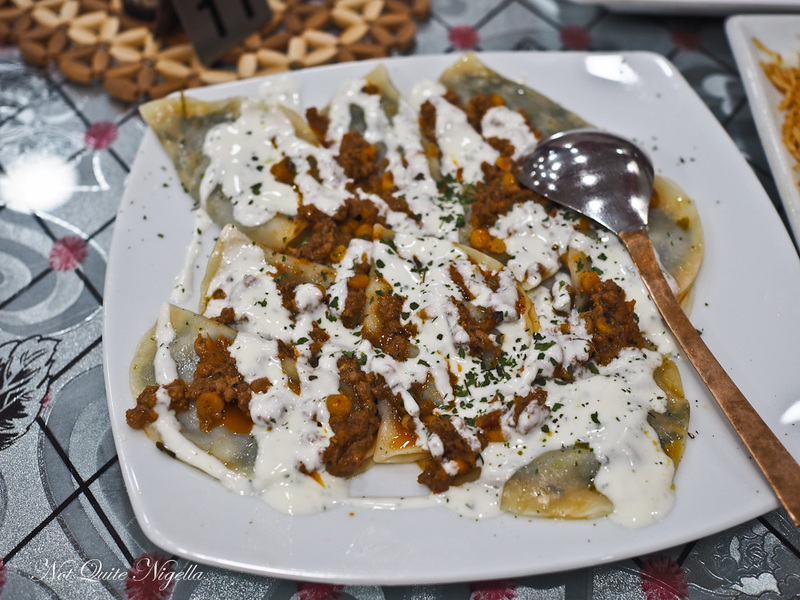 They are known for their mantu - dumplings stuffed with lamb with thin skins not unlike Chinese dumplings and them a topping of split pea dahl and yogurt. They're fantastic and you're best to order enough so that get at least two per person. 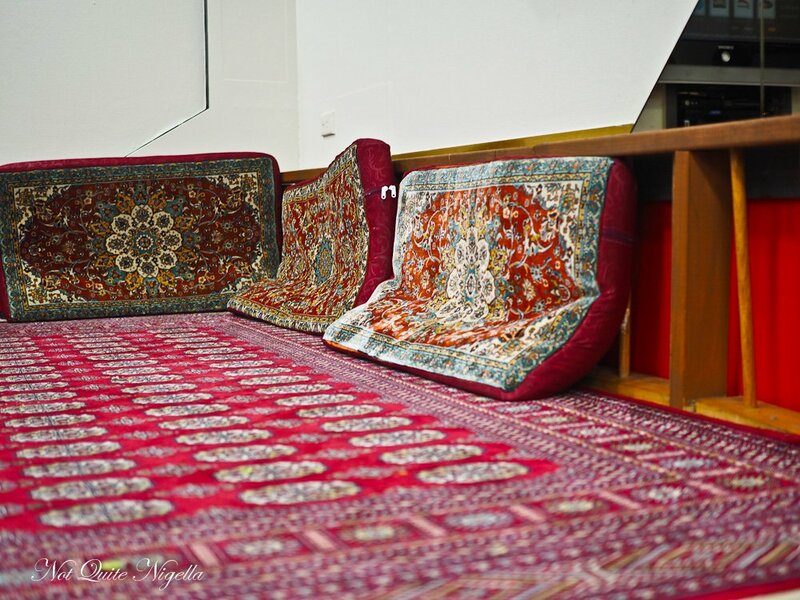 The sign near the counter says, "Ashak now available". I am curious about these dumplings. 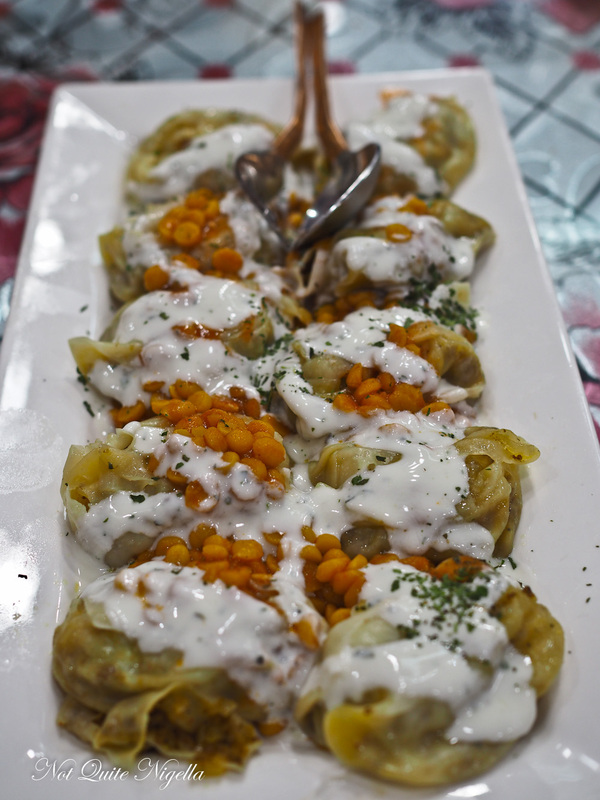 Flatter and less filled than the Mantu they're filled with vegetables and are said to be time intensive to make. They are like mantu in the reverse. Half moons instead of round pouches the meat is in the sauce on top instead of inside. There are two types of family platters, one with rice and one without and we go for the former. I think we had also forgotten how much we had ordered and also underestimated the sizes of things. 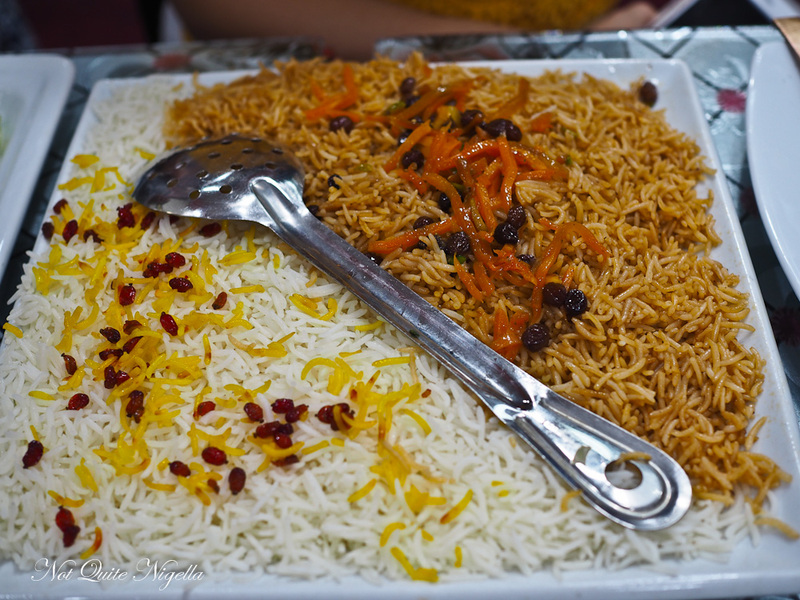 There is a large plate of rice that comes with it with two types of rice: a bright yellow long grain white rice with sultanas and grated carrot and a white rice with barberries. The meat platter is enormous and certainly impressive. The meats are all delicious and tender. 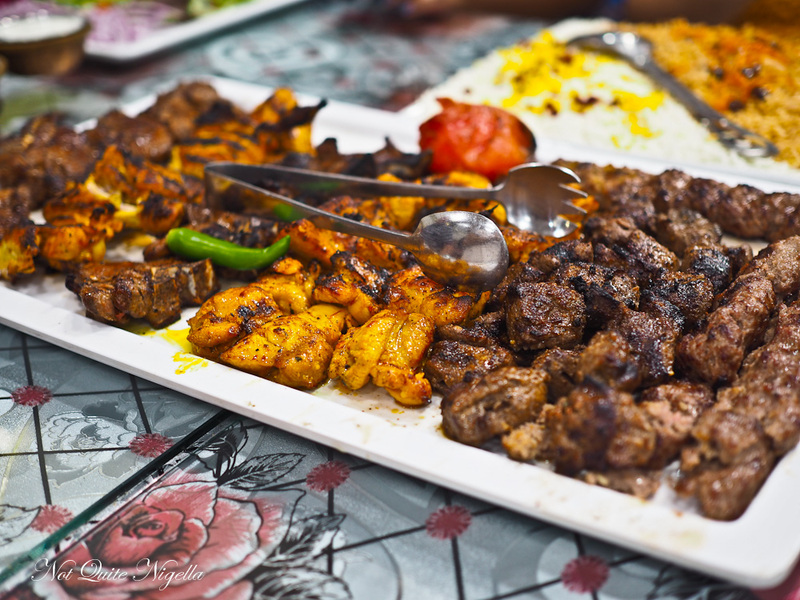 It's hard to choose a favourite: the chicken is moist and juicy while the lamb is succulent and the beef sings with flavour. This is my favourite dish here. I know some people don't love raw onion but red onion is so sweet and mild and goes so well with the meat that I heap a pile of them on top of my meat. 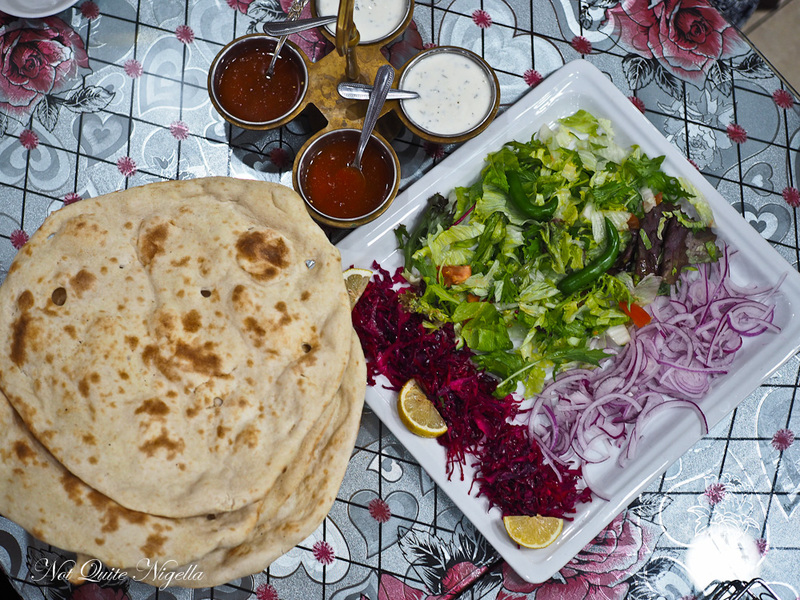 Accompanying all of this is a basket overflowing with complimentary rounds of Afghan bread, one per person. It's almost naan like in thickness and it's incredibly filling. By the end I can only manage a quarter a round of the bread but they are happy to provide bags and boxes to take the food away. This looks to be one of the most popular dishes in the restaurant - every single table seems to have at least one plate of this and we pass a long table where everyone has a plate of this. 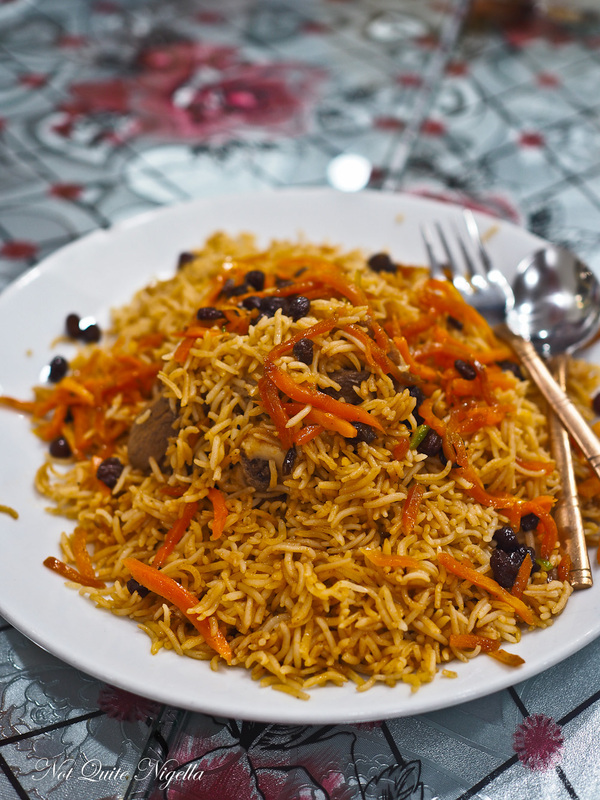 Amongst the long grained rice is a lamb shank, velvety soft and baked into the rice. It's a mild flavoured, comforting dish. Louise doesn't find it flavoured enough while Viggo likes the mildness. Honestly, we could have done without ordering this because there were two types of chicken on the family platter but they were wings and boneless pieces and this is literally a half chicken. I also found the pieces on the platter to be a bit juicier than the half chicken. We've been eating up a storm and we have enough to fill two enormous takeaway boxes. Come 8pm the restaurant becomes extraordinarily busy and our table ends up being hot property. 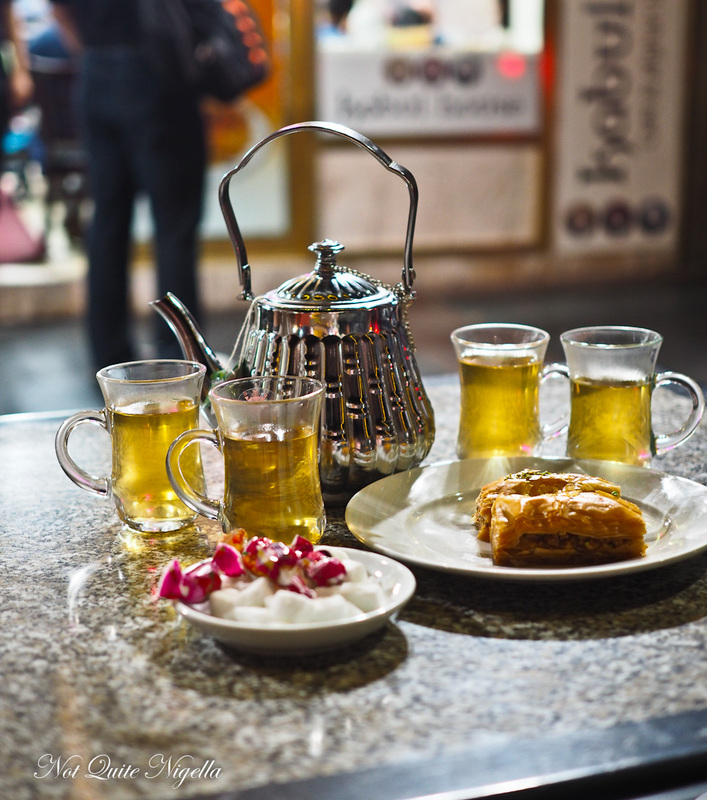 We move outside to have tea and baklava. The cardamom tea is fragrant and can be sweetened according to taste. The baklava is made in house and is freshly made and comes with a generous soaking of syrup. 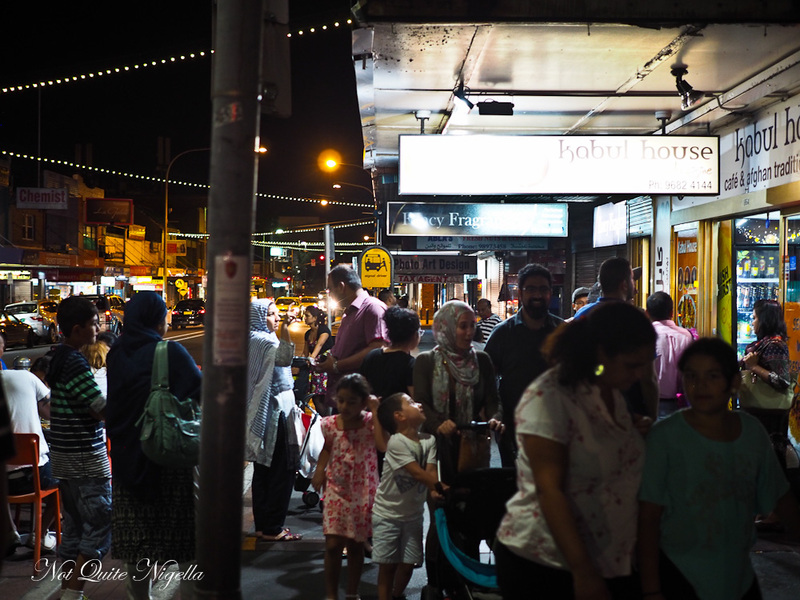 We pop the chewy fruit lollies in our mouths and watch the busy main street of Merrylands on a Saturday night before the crowds gather outside the restaurant, all eager for a table. So tell me Dear Reader, how do you like to spend your Saturday nights? Out with friends or family? Or entertaining at home? If you over order do you take the food away?